As a youth, Robert Baden-Powell greatly enjoyed the outdoors, learning about nature and how to live in the wilderness. After returning as a military hero from service in Africa, Baden-Powell discovered that English boys were reading the manual on stalking and survival in the wilderness he had written for his military regiment. Gathering ideas from Ernest Thompson Seton, Daniel Carter Beard, and others, he rewrote the manual as a nonmilitary nature skill book and called it Scouting for Boys. To test his ideas, Baden-Powell brought together 22 boys to camp at Brownsea Island, off the coast of England. This historic campout was a success and resulted in the advent of Scouting. 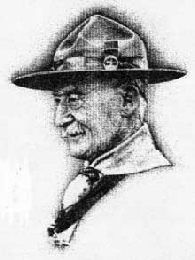 Lord Robert Baden-Powell of Gilwell, Founder of Scouting and World Chief Scout died in Kenya on January 8, 1941 at the age of 83. Soldiers and Scouts, black and white escorted the coffin to a simple grave at Nyeri, within sight of Mount Kenya.